8 high current outputs in eight fully isolated sections. 4 outputs with groundbreaking, stepless voltage regulation feature (1V – 24V DC), adjustable by multi-turn screw. The screen on the top is showing voltage value set on each output. 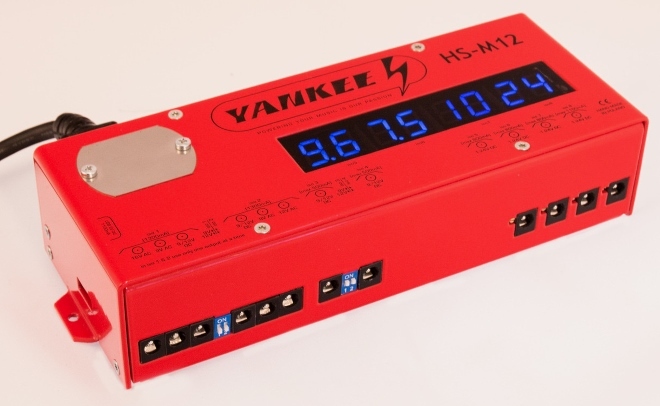 2 AC outputs (9V, 12V or 16V) with 1300 mA or 2000 mA max current that can also be used as 9V or 12V DC. USB output that can charge mobile device or power LED lam to put some light on Your pedalboard. Powerfull, highest quality Toroidal Transformer that will not cause any unwanted noise, even when put directly next to effects. Efficient voltage filters and stabilizers for perfect sound during whole performance. Overheat and short circuit protection will always keep Your effects safe. Fits under Pedal Train and can be easily attached to any pedalboard with screws.